Brock's line of on-farm grain storage bins offer a number of industry-leading features designed to make the bins more convenient to use and to add value for dependable, secure grain storage. Bin anchor system securely fastens bin to foundation and helps prevent sidewall shifting that could break the seal and cause leakage. Every roof is supplied with a large manhole that is “obround” for easy entry and exit. Its cover has heavy hinges and a strong, rotating latch. A sturdy handrail next to the manhole is included. Giant 39-inch (991-mm) fill hole features a rigid 24-inch (610-mm) diameter center ring to accommodate most auxiliary equipment. High strength Grade 8 bin seal bolts are used in all BROCK® On-Farm Grain Bins. Choose either the JS1000™ rust-resistant coating or Brock's optional rust-proof polypropylene-encapsulated bin assembly bolts. Brock's strong sidewall body sheets are made with G-90 galvanized steel with a tensile strength of 65 ksi (448 Mpa) to protect your grain and provide maximum strength. Spun steel lid is shaped from a single piece of galvanized steel for a tight, life-long fit. The lid opens wide for easy access to the fill hole or latches tightly to make a weather-resistant dome. Every roof is supplied with a large manhole that has a people-friendly "obround" shape for easy entry and exit. Its cover has heavy hinges and a strong, rotating latch. A sturdy tubular handrail placed next to the roof manhole is standard on Brock bins to assist entry and exit through the opening. Brock's strong sidewall body sheets are made with G-90 galvanized steel with a tensile strength of 65 ksi (448 Mpa) to protect your grain and provide maximum strength at all levels. Bins are available with your choice of either narrow-corrugation (2.66-inch / 68-mm wide) or wide-corrugation (4-inch / 102-mm) models. Identification codes are stamped on every body sheet providing manufacturing date, part number and steel gauge. Sidewalls for all BROCK® On-Farm Grain Bins are assembled using high strength Grade 8 bin seal bolts with the JS1000™ rust-resistant coating. Brock’s optional rust-proof polypropylene-encapsulated bin assembly bolts provide enhanced corrosion resistance. 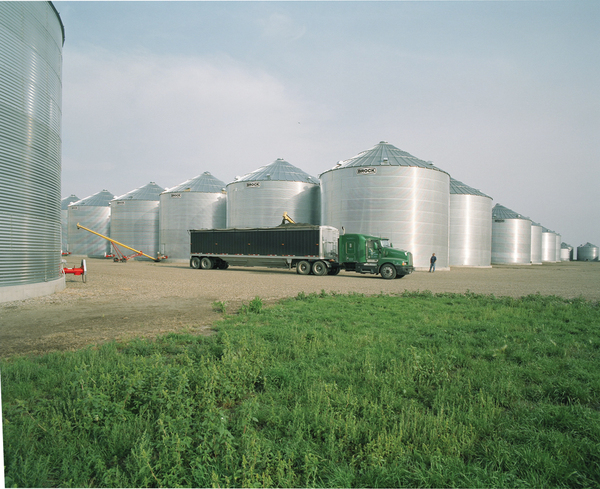 Grain bin foundations are designed to secure the bins against 90 mph (145 kph) winds. The bin anchor system supplies a strong, load bearing connection to the foundation. This design, combined with the foundation sealant, helps to provide a weather-tight seal. Brock's industry-leading five-year warranty program on farm grain bins - we believe we have the best warranty in the industry! See Brock’s full written warranty for complete warranty details. Contact us or your professional Brock dealer to learn even more about Brock’s industry-leading systems.